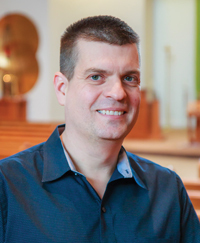 Chris Brunelle is a music minister at Holy Family Parish in Portland, OR. In these videos, he teaches viewers how to play songs from Breaking Bread, Today's Missal and Music Issue. Just in time for the upcoming liturgical year, these videos feature brand-new compositions for 2019. "A Place at Your Table"
With its lightly swinging beat and easy going feel, this song speaks of God’s love for us. He invites us to his table, where there is room for all. "Al Partir el Pan/In the Breaking of the Bread"
Ideal for All Saints’ Day and funeral liturgies, this song celebrates the great community of the faithful and reminds us that we are never truly alone. This song, arranged for SAB choir with solo accompaniments, adds to the feeling of longing we have for the Savior’s arrival during our Advent journey. This peaceful song of courage and hope is presented with a multitude of voicing options, and your congregation will find it easy to sing along! This accessible hymn features themes of gathering and unity. It is appropriate for Gathering or Preparation of the Gifts throughout the liturgical year. This song explores themes of creation, peace, and social concern, as articulated in Pope Francis' papa encyclical Laudato si’. Because of its mild syncopations and melodic contour, this energetic assembly song of praise and comfort is effectively sung as written or with a gospel swing. This easy-to-learn litany would be appropriate at any liturgy celebrating the gift of creation and our responsibility to be good stewards of the earth. Beautifully combining the ancient and the new, this contemporary anthem is ideal for both Communion and adoration of the Blessed Sacrament. "As Christ Is for Us"
From the care of those less fortunate than ourselves to the stewardship of our environment, this lyrical text is set to a gently rocking accompaniment in triple meter. "God of Might and God of Mercy"
This strong hymn focuses on themes of mercy and God's love for us. There is also an alternate verse that is thematically tied to the Papal encyclical, Laudato si'. This is a gentle song of comfort that is suitable for funeral liturgies, Anointing of the Sick, and Commemoration of All the Faithful Departed. This beautiful bilingual piece is perfect for use on Ash Wednesday and throughout the Lenten season. It is be appropriate for Penitential services throughout Lent. "Exodus 15: Let Us Sing to the Lord"
Complete with chanted verses and a metered refrain, this musical setting of the Exodus Canticle is ideal for use during the Easter Vigil as a responsorial psalm. Suitable for use during the season of Easter, this song sings of the joy of the Jesus’ resurrection, the hope for eternal rest, and the peace of his healing love.